St David's an the Cathedral Close, mair commonly kent as St David's, (Welsh: Tyddewi), is a ceety an community in Pembrokeshire, Wales. It is Breetain's smawest ceety. Lyin on the River Alun on St David's peninsula, the toun is the de facto ecclesiastical caipital o Wales an the final restin place o Saunt Dauvit, the kintra's patron saunt. The aurie wis oreeginally kent in the Welsh leid as Mynyw an in Laitin as Menevia, an wis later renamed in honour o Dauvit. The ceety is biggit aroond St David's Cathedral, which in the Middle Ages wis a popular place o pilgrimage. Next tae it, the 14t-century Bishop's Palace is a ruin maintained bi Cadw an open tae visitors. St David's wis ance a maircher borough. 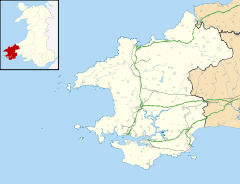 In 1603 the antiquarian George Owen describit it as ane of five Pembrokeshire boroughs owerseen bi a portreeve. Tradeetion states that Saint Dauvit wis born tae Saunt Non at wha is nou St Non's, a ten minute walk sooth o the ceety, in aboot AD 500. It is an aa said that he wis baptised at Porthclais, nou the ceety's port, an that he foondit the ceety in aroond 550. Pape Calixtus II decreed that twa pilgrimages tae St David's wur equivalent tae ane tae Roum. Acause o this a vast income wis raised frae visitin pilgrims in the Middle Ages. Saunt Non's Well owerleuks the Pembrokeshire Coast Path an St Brides Bay. The Cambrian cliffs mak this a popular spot for walkers an kayakers. In addition tae the cathedral, attractions in the ceety include the 13t century Touer Gate, the Celtic Auld Cross an a nummer o airt galleries. St David's is an aa a popular base for walkin an water sports. It haes several hottles an a youth hostel, an a nummer o pubs. St David's is the anerlie ceety in the Unitit Kinrick tae lie entirely in a naitional pairk, the Pembrokeshire Coast National Park, an it lies near the Pembrokeshire Coast Path. The St David's lifeboat, locatit at St Justinian, haes saved numerous lifes syne the first lifeboat wis locatit thare in 1869; an a nummer o heroic lifeboatmen here hae perished in the cause of saving others. Particular local marine perils are the treacherous reefs an formations aff the coast thegither wi the unpredictable Erse Sea conditions. The entire coastline aroond St David's forms pairt o the Pembrokeshire Coast National Park. Local agricultur haes declined in recent years, wi the ance important crop o Pembrokeshire first early new potatoes haein lairgely dee'd oot due tae pressure frae the supermercats. St David's Eco Ceety Group aims tae mak St David's the first carbon-neutral ceety in the warld. St David's is hame tae the rugby union team St. Davids RFC. St David's hostit the National Eisteddfod in 2002. Henry Hicks (1837-1899), a Welsh pheesician, Member of the Royal College of Surgeons (MRCS), Preses o the Geological Society an Fellow o the Royal Society (FRS). He studied the Precambrian rocks o Anglesey, Caernarvonshire an Pembrokeshire, the Devonian rocks o Devon an Somerset, an cave deposits in Denbighshire. He wis born on 29 Mey 1837 at St David's, follaed in the fuitsteps o his faither Thomas Hicks an studied medicine at Guy's Hospital, an then practised at St David's frae 1862 till 1871. Muisician David Gray an fitbawer Simon Davies wur pupils at St David's School. Asser, friend o Keeng Alfred the Great, an writer o his biography, wis a monk at St David's afore bein cawed intae Alfred's service. Wikimedia Commons haes media relatit tae St Davids.